How do I add a Terms and Conditions to my event? Adding "Terms and Conditions" enables organizer ask attendees to agree with your events terms and conditions before they can proceed with order.If this feature is enabled the buyer will need to check a box agreeing to the terms and conditions of your event before purchasing the ticket. You can access it by visiting the Dashboard and going to Registration form under Setup. 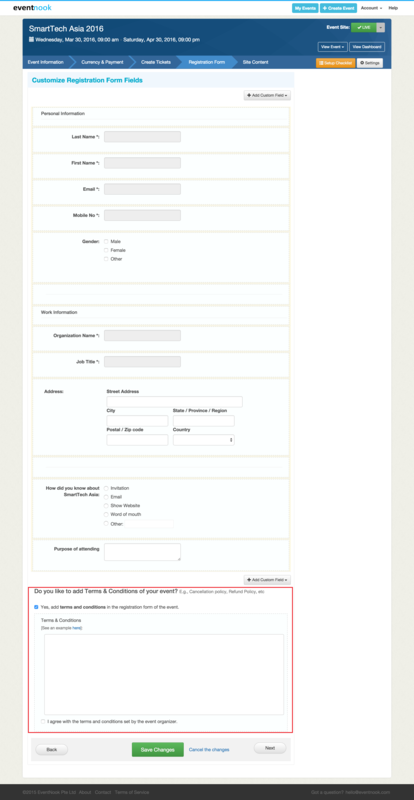 Check the "Yes, add terms and conditions in the registration form of the event" to add.